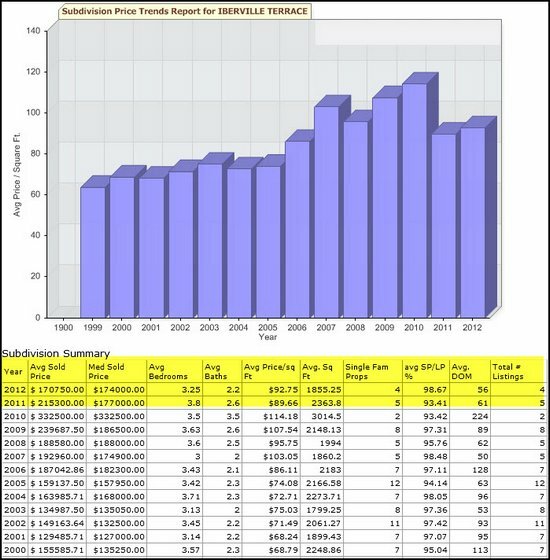 I recently completed a Baton Rouge Louisiana Housing market study of Iberville Terrace Subdivision and discovered these 2012 home price trends based on 4 sales. Average sales price per square foot has been $93/sf. Median Sales Price $174,000. Average size home sold 1,855 sf. Average days on market 56 days. Average Listing-To-Sales-Price-Ratio is 99% meaning homes are selling for 99 percent of asking prices, only 1 percent less than asking price. There are currently 6 listings in Iberville Terrace, only 1 of them pending as the listing price are far above 2012 support at $93/sf and 2011 support at $90/sf. Active Listings average $106/sf, which is $13/sf above what the 4 other homes in Iberville Terrace have sold for in 2012. Pending Listing is listed at $102/sf, which is $9/sf above what the 4 other homes in Iberville Terrace have sold for in 2012. Some of the listings may have been updated and may have slab granite counters. And, this is all about Location, Location, Location. The 3 listings at $113, $123 and $119/sf are clearly well above market support, especially the $123/sf. The $123/sf home fronts Perkins Road and MLS indicates commercial or business appeal. It appears sellers are trying to test the market with asking prices at least $10/sf above traditional Iberville Terrace support. 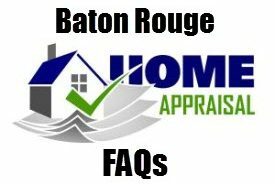 My very strong advice here is that if you are looking at a home to buy in Iberville Terrace priced above $93/sf, get a Baton Rouge Pre-Purchase Home Appraisal to make sure you don’t overpay. 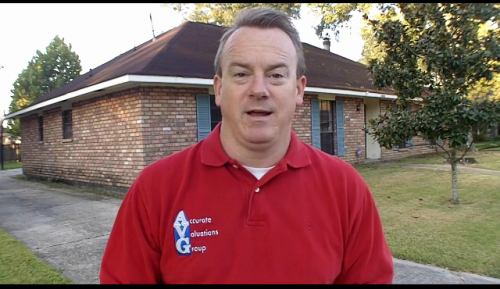 This Baton Rouge Louisiana Housing Market Report is brought to you by Baton Rouge Home Appraiser Bill Cobb. 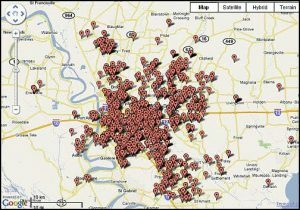 NOTE: Based on info from the Greater Baton Rouge Association of REALTORS®MLS for the period of 01/01/2012 to 09/28/2012. This information was extracted on 09/28/2012. Yes, this Appraiser does have the permission of GBRAR to use the chart above.